Visit Morjim and Shanta Durga Temple for their historical value. 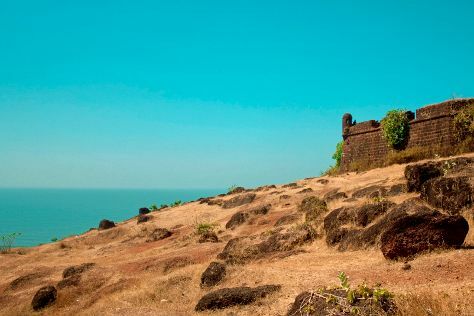 Eschew the tourist crowds and head to Mandrem Beach and Reis Magos Fort. There's lots more to do: tour the pleasant surroundings at Utorda Beach, enjoy some diversion at Milsim Goa, relax in the rural setting at Tropical Spice Plantation, and kick back and relax at Varca Beach. For photos, where to stay, other places to visit, and more tourist information, refer to the Goa trip itinerary builder. Des Moines, USA to Goa is an approximately 33-hour flight. Due to the time zone difference, you'll lose 11 hours traveling from Des Moines to Goa. Cap off your sightseeing on the 10th (Tue) early enough to travel to Jaisalmer. Your inner history buff will appreciate Maharaja's Palace and Mandir Palace. Discover out-of-the-way places like Nature & Wildlife Tours and Jaisalmer War Museum. Go for a jaunt from Jaisalmer to Kanoi to see Sam Sand Dunes about 44 minutes away. Spend the 14th (Sat) spotting exotic species with a safari tour. There's much more to do: don't miss a visit to Bada Bagh, contemplate the long history of Dussehra Chowk, look for gifts at Dharan Book Store, and contemplate in the serene atmosphere at Rishabhadeva Temple. To find where to stay, photos, other places to visit, and other tourist information, you can read our Jaisalmer vacation trip planner. You can do a combination of flight, train, and taxi from Goa to Jaisalmer in 13 hours. Alternatively, you can drive; or do a combination of train and taxi. Wrap up your sightseeing on the 17th (Tue) early enough to travel to Bharatpur. Once a fortified city thought impregnable, Bharatpur today welcomes guests with open arms, as one of the main stop-offs on the Delhi-Jaipur-Agra Golden Tourism Triangle. On the 18th (Wed), explore the striking landscape of Keoladeo National Park. To see reviews, other places to visit, traveler tips, and more tourist information, refer to the Bharatpur tour planner. You can drive from Jaisalmer to Bharatpur in 12 hours. Wrap up your sightseeing on the 19th (Thu) early enough to travel to Jaipur. Popular historic sites such as Chand Baori and Govind Dev Ji Temple are in your itinerary. Eschew the tourist crowds and head to Albert Hall Museum and Diwan-e-Khas Hall of Private Audience. Spend the 20th (Fri) wandering through the wild on a nature and wildlife tour. The adventure continues: get the lay of the land with Walking tours, make a trip to Monkey Temple (Galta Ji), contemplate the long history of Royal Gaitor Tumbas, and take a peaceful walk through Grass Farm Nursery. To find where to stay, more things to do, maps, and tourist information, read Jaipur trip itinerary builder. You can drive from Bharatpur to Jaipur in 3.5 hours. In October, daily temperatures in Jaipur can reach 94°F, while at night they dip to 70°F. On the 24th (Tue), wrap the sightseeing up by early afternoon so you can travel to Somnath. Kick off your visit on the 25th (Wed): make a trip to Gita Mandir, contemplate in the serene atmosphere at Somnath Mahadev Temple, then contemplate in the serene atmosphere at Somnath Temple, then take in the spiritual surroundings of Panch Pandav Gufa, and finally take in the spiritual surroundings of Bhalka Tirth. Keep things going the next day: take in the spiritual surroundings of Kamnath Mahadev Temple, then take in the spiritual surroundings of Shree Parshuram Temple, and then don't miss a visit to Triveni Sangam. To find maps, more things to do, photos, and other tourist information, refer to the Somnath trip itinerary maker. Do a combination of flight and taxi from Jaipur to Somnath in 6 hours. Alternatively, you can drive; or take a bus. 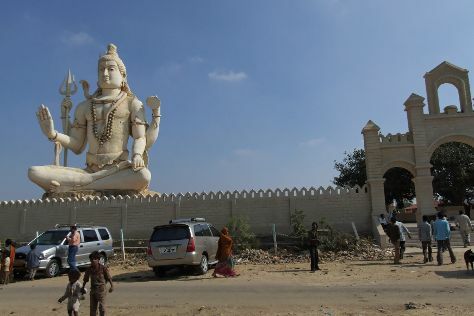 Finish your sightseeing early on the 26th (Thu) to allow enough time to drive to Dwarka. Get some historical perspective at Nageshwar Shiva Temple and Bhadkeshwar Mahadev Temple. Explore hidden gems such as Nature & Wildlife Tours and Rukshamanee Mandir. Next up on the itinerary: don't miss a visit to Dwarkadhish Temple, get outside with Dunny Point, take in the spiritual surroundings of Nageshwar Jyotirlinga Temple, and tour the pleasant surroundings at Gomti Ghat. To see reviews, where to stay, maps, and other tourist information, use the Dwarka itinerary planner. You can drive from Somnath to Dwarka in 3.5 hours. Other options are to take a train; or take a bus. Wrap up your sightseeing on the 29th (Sun) to allow time to travel back home.